The start of the holiday season, which celebrates generosity and selflessness, also kicks off a frenzy of TV ad campaigns that combine the merciless combat of business competitors with a cheery soundtrack of festive music. Tablet makers seem to have snapped up a hefty share of the prime-time TV spots as they vie for the holiday gift sales that often deliver a major chunk of annual revenues for retailers and manufacturers. Politicians could glean some tips about negative ad campaigns this season by watching Apple’s competitors dissect the iPad, the 2013 worldwide market leader with 36 percent of units sold. The tablet universe is leaving plenty of room for new entries. Back in 2012, Apple had sold nearly 53 percent of tablets worldwide, according to research company Gartner. Since then, Samsung and some of the other tablet makers have both enlarged the market and grabbed larger shares of it. To get a feel for that market, forecast at $27.3 billion for U.S. tablet sales alone this year by the Consumer Electronics Association, I met with Intel executive Chris Walker at a downtown San Francisco eatery recently. He brought along a collection of tablets from HP, ASUS, Lenovo, and other manufacturers that use Intel’s chips. As a supplier of the key parts that make tablets work, Intel is hoping that consumers are interested in buying tablets for just about anyone, regardless of age. Walker showed me the stubby little ClickN Kids Tablet 2, enclosed in pink rubber bumpers to withstand the attentions of toddlers as little as two years old. At the other end of the specialty tablet range was the AARP RealPad, which features prominent help sections for people new to tablets, such as the retirees served by the AARP organization. Santa Clara, CA-based Intel is a tech industry stalwart with a strong track record in PCs and servers, and $9.6 billion in net income in 2013. But the company has been trying to catch up after a late move into the mobile realm, where phones, tablets and hybrid tablets with keyboards are market challengers that affect PCs and laptops alike. To make sure it has a place at the table, Intel is subsidizing the purchase of the chips—Intel’s expensive ticket into a tablet arena dominated by ARM processors made by other manufacturers. Intel has also helped tablet makers with engineering and software development, Walker says. 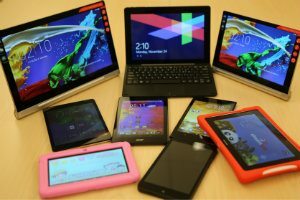 And it’s not leaving the marketing chores to its tablet partners alone: Intel publishes a magazine-style holiday buying guide to the various tablet models containing its chips, and stages events called Experience Zones at stores where consumers can test-drive the devices in person. As a result of all these efforts, Intel’s mobile and communications division lost more than $3 billion in the first nine months of this year. But the company is betting that its spending and its ongoing technology development will pay off. By working with partners, Intel has a role in shaping the forms and functions of tablet offerings. But figuring out what device formats most consumers will prefer must be tough, because mobile devices can carry out so many different functions—from phone calls, texting, photography, game playing, Web surfing and video streaming to document creation and other work-related chores. One strategy is to try to please everyone by stuffing into a tablet almost everything you’d find in a laptop. Walker gives a rationale for people to replace their laptops—when they’re a venerable four years old—with one of the smaller, lighter, tablets equipped with detachable keyboards. “They can be two to seven times faster than their old notebook, and half as thick,” Walker says. Intel supplies parts for some of these two-in-one devices, such as the E FUN Nextbook 10.1, which can handle entertainment features and office productivity software alike. But tablet prices have dropped enough so that families can afford a sort of wardrobe of differentiated tablets, each designed for a different user or limited setting, Walker says. For example, the little ClickN Kids Tablet, pre-loaded with children’s apps, sells for about $70. Sales of low-cost tablets like those Walker showed me seem to be growing. In the United States, tablets costing less than $200 made up 49 percent of units sold over an eight-week holiday run-up period late this year, market research firm NPD Group reported. But there’s fierce competition within that low-end segment. The widely sold, inexpensive 7-inch models have lately given ground to new, larger tablets with displays of 9 inches or more, NPD found. Meanwhile, Intel is on track to reach its goal to ship 40 million processors for tablets in 2014—a jump from 10 million in 2013. Next year, the company will continue subsidies to tablet manufacturers that buy the same kinds of chips Intel has been selling them this year. But the subsidies are expected to go down for a new generation of chips to be rolled out in 2015, Intel spokeswoman Agnes Kwan says. These new chips include the Sofia processor, which is geared toward the growing segment of cost-competitive mobile devices, she says. Intel hasn’t set formal goals for a total number of processors shipped next year, she says.